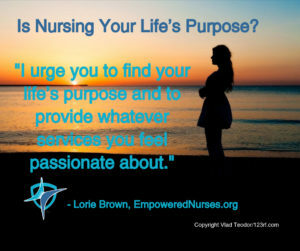 Is Nursing Your Life’s Purpose? When I was 10 years old and at an overnight camp, I was horseback riding and fell off the horse. Fortunately, I was wearing a helmet, but I still lost consciousness. When I came to and opened my eyes, I could make out a woman bending over me, all dressed in white with the sun shining behind her, like a halo. I wasn’t sure if I had died and this was an angel, but she calmed me by telling me she was a nurse. She promptly scooped me up and drove me to the hospital to be checked. This was my first encounter with a nurse. Once I began feeling better, I barraged her with all kinds of questions about being a nurse ranging from “What do you like about being a nurse?” to “How do you help people?” That day I made the decision that I wanted to be one of them: a nurse. I know many nurses whose decision to get into the profession was from the influence of a role model. And now, as an attorney, I never really left nursing. As a nurse, a patient won’t have a sign on their head saying that they have alteration in comfort due to small bowel obstruction but, as a nurse, you still have to assess, plan, intervene and evaluate to determine the best care. With my legal clients, they don’t come to me with a sign over their head of what their problem might be. I have to assess, plan, intervene and evaluate to come to the best strategy for their matter. I believe nursing, whether it be nurse-to-patient or nurse-to-nurses, is my life’s purpose. I notice with some nurse clients, they seem to have an attitude of “Oh, just let them take my license. They can have it!” Others love being a nurse and want to continue, so they fight. If nursing is your life’s purpose, I encourage you to be the best nurse that you can be and make the changes that are necessary to improve yourself and our profession. However, if nursing is not for you, that’s okay! Some nurses went into nursing due to family pressure or they knew there are plenty of jobs with good pay. I urge you to find your life’s purpose and to provide whatever services you feel passionate about. If you feel that nursing is your life’s purpose, I’d like to hear any of your comments below as well as how you are fulfilling that purpose.